Cactus Flower Florists: Three gifts for $10? Yes! Three gifts for $10? Yes! Do you have a neighbor, teacher or friend that's special to you? You don't have to spend a lot of money this Christmas to show your thoughtfulness. Make three of these darling arrangements with a $10 Fresh Ten wrap and items you have at home. Simply place one stem of hydrangea and greens in each vessel and wrap a Christmas bow around the neck. 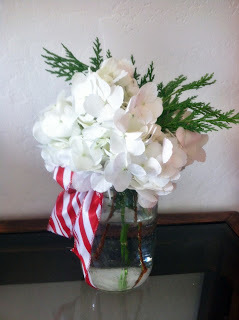 Easy, super inexpensive, and so thoughtful!